Why would Darwin choose to attend Edinburgh? The quick answer is that he didn’t – his father decided for him, and Edinburgh was chosen because it was a family tradition to go there to study medicine. In fact, anyone pursuing a career in medicine was wise to go to Edinburgh, as since the mid-18th century it had been the best medical school. Oxford and Cambridge could give you academic teaching, but only if you were an Anglican, and they had no hospitals. London had no shortage of hospitals, but they had no university at that stage. Edinburgh had both a hospital and a university, allowing the parallel teaching of both theory and practice not afforded by anywhere else at the time. And this is the simple reason why both Darwin’s grandfather and father had received their medical training at the University of Edinburgh – grandfather Erasmus (1731–1802) in 1755 (aged 22) and father Robert (1766–1848) in 1786 (aged 20) – both forging family ties and friendships while they did. 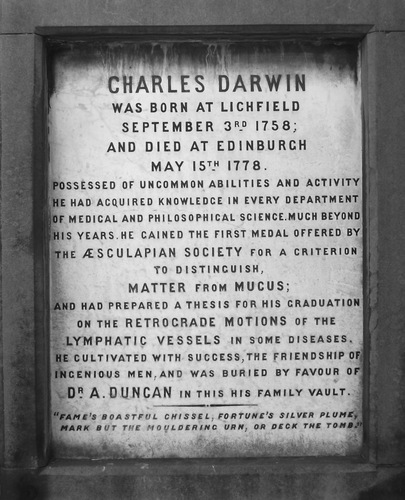 One Darwin never managed to leave: Darwin’s uncle, another Charles Darwin (1758–1778), died from meningococcal meningitis, contracted during a post-mortem, while studying in Edinburgh. He was buried in the Duncan family vault in the Chapel of Ease at St Cuthbert’s Church which is beyond the west end of Princes Street Gardens, on the corner of Lothian Road and King’s Stables Road. I have attempted on several occasions to find his burial place. The reason I couldn’t is very simply that it is not there, but instead at an overflow site located at the junction of Buccleuch Street and Chapel Street in Edinburgh. The former Buccleuch Parish Church, was built c.1756 as a Chapel-of-Ease by the kirk session of St Cuthbert's Parish Church in Lothian Road in association with a new graveyard because their own had become so overcrowded. It was rebuilt as an unimpressive Gothic edifice in 1866 by David MacGibbon (1831–1902). Today, the church acts as a furniture store for the University of Edinburgh, but the kirkyard remains of interest as the burial place of mental-health pioneer Dr Andrew Duncan (1744–1828), the infamous robber Deacon Brodie (1741–88) and Alison Cockburn (1713–94), best known for a version of the ancient Scottish folk tune, Flowers of the Forest. Additionally it is there, within Andrew Duncan's family vault, that the grave can be found of Charles Darwin (1758–78), uncle of the famous naturalist. 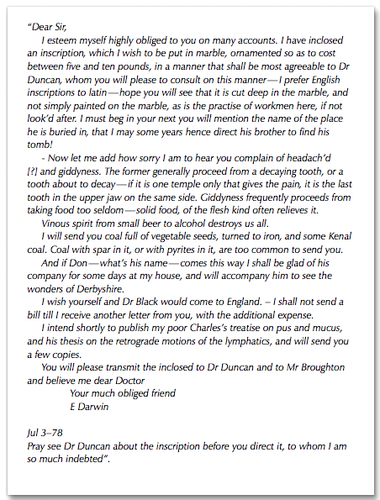 Unlike his nephew, who would fail to follow in his footsteps, this Charles Darwin was proving to be a very talented medical student, except he died on 15 May 1778, apparently from a cut sustained while performing an autopsy. About the end of April, Mr. Darwin had employed the greatest part of a day in accurately dissecting the brain of a child which had died of hydrocephalus, and which he had attended during its life. That very evening he was seized with severe head-ach. This, however, did not prevent him from being present in the Medical Society, where he mentioned to Dr. Duncan the dissection he had made, and promised the next day to furnish him with an account of all the circumstances in writing. But the next day, to his headach there supervened other febrile symptoms. And, in a short time, from the hemorrhagies, petechial eruption, and foetid loose stools which occurred,his disease manifested a very putrescent tendency. The clinical picture described here, particularly the petechial haemorrhages, strongly supports a diagnosis of meningococcal disease. This Charles' father, the famous Erasmus Darwin, was summoned to Edinburgh, and for a few days after he arrived he had hopes that Charles might recover but this was not to be. Whilst in Edinburgh, Erasmus likely stayed with his good friend James Hutton (they had met four years before, but kept up their friendship for twenty). He later wrote this letter to Hutton, entrusting him with supervising the cutting of the grave's inscription (also below). Charles Darwin's younger brother Erasmus Darwin II became a rich solicitor, but in 1799 drowned himself in the River Derwent. The youngest of Erasmus Darwin's three sons, Robert Waring Darwin, followed his father and oldest brother into medicine, becoming a successful physician. He married Susannah Wedgwood, and in the family tradition they named their first boy after his grandfather and uncle, Erasmus Alvey Darwin.